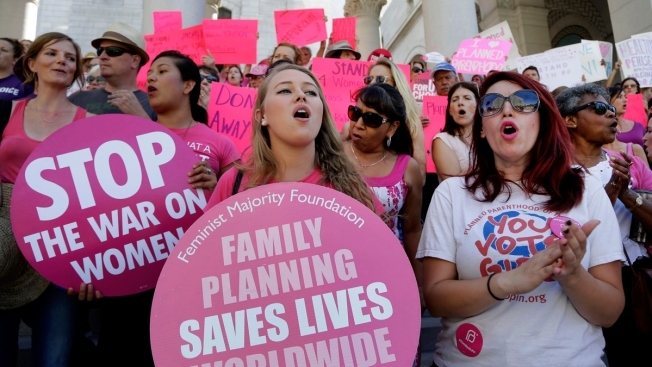 In this Sept. 9, 2015, file photo, Planned Parenthood supporters rally for women's access to reproductive health care on "National Pink Out Day'' at Los Angeles City Hall. A new study found that abortions do not cause depression. A new study found that abortions do not cause depression, but women who have depression and anxiety may be more likely to have abortions, NBC News reported. The study, which was reported in the Journal of the American Medical Associations JAMA Psychiatry, is the latest to show no evidence that abortion causes depression. The researchers say that policies citing damage to mental health as a reason to restrict access to abortion aren’t based in fact. The study drew from Denmark’s national database, covering close to 400,000 women born after 1980 and which details abortions — something that may less accurately show up in U.S. data, where abortions may or may not be recorded. The team compared women who filled prescriptions for antidepressants to women who didn’t. "Compared with women who did not have an abortion, those who had an abortion had a higher rate of antidepressant use," the researchers wrote. "A close look at the data, however, suggests that the higher rates of antidepressant use had less to do with having an abortion than with other risk factors for depression among women who had an abortion."